The crochet grit stitch is a great stitch for beginners or anyone, really. It’s simple to work because it’s all single crochet. 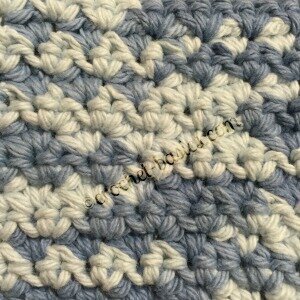 The mixed grit stitch is just as easy with some double crochet thrown in. So, it’s perfect for when you’re just learning. It looks great with a little bit of a v-stitch look to it. It also has a nice texture without being too bumpy. That’s really nice for projects for kids and babies. The mixed grit stitch is actually my favorite of the two stitches. It looks so textured and complicated, but in a soft, pretty sort of way. You’ll see what I mean when you work it. It’s really great. Don’t worry either, because If you can work the grit stitch, then the mixed grit stitch will be easy as pie. Let’s give them both a try. This stitch is worked in multiples of 2 + 1. Repeat from * to * until 2 chains remain. Sc in the last chain. Repeat from * to * until 1 stitch remains. Sc in the turning chain. Do you feel like you have the hang of the Crochet Grit Stitch? Give the Mixed Grit Stitch a try. This stitch is worked in the same way as the crochet grit stitch, except that some of the single crochet are replaced with double crochets. This stitch is also worked in multiples of 2 + 1. It was easy, right! And, how fantastic does it look! Have fun with with both these stitches!